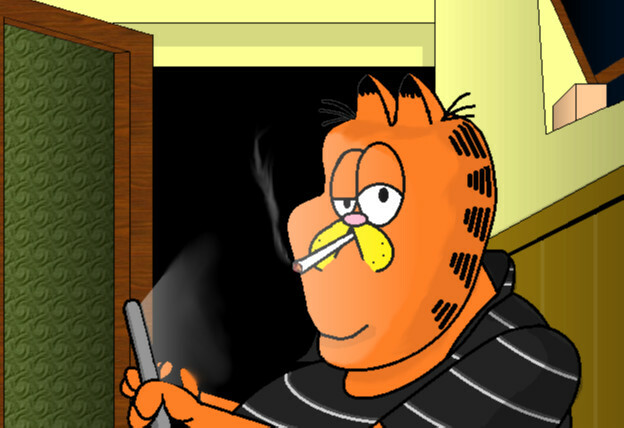 It's Garfield as the youtube-vlogger Krisztián Molnár, who got to be famous by his live streamings in which he gets drunk while listening to techno and rap music. This event is called "bebaszós lájv" (getting-drunk live), but he regrets to do it often, as he makes these streams only if he gets enough donation through PayPal. He is also notable by his question-answer videos, where he answers to some loaded questions sent by his fans (the answers are reflecting to his poor knowledge, so he answers them usually badly). Night tablet live, the jealous Jon didn't make Lasagna Xd. I admit the above is not really enjoyable, I just inserted it to show how does it look like. Due to his appeariance in Youtube, there are plenty of remixes and parodies that have been made using his catchphrases. The most frequent one is "irigy" (meaning jealous, but he pronounces it as "iligy", as he burrs). He calls everyone and everything like that who critisises him or is simply against him. Recently in a tv show, his channel was nominated as the 6th WORST of Hungarian Youtube. The funniest part is the apparent similarity between Garfield and Molnar - both look obese and both have overgrown ego.